As fiber optic technology continues to revolutionize the telecommunication and data capabilities of a range of industries, the average individual may not understand the advantages that fiber optic technology provides for us in our everyday life. In fact, fiber optic technology has been a part of daily life for many years, although most of us may not be aware of its impact. To better understand the advantages and capabilities of fiber optic technology, we’ll outline a few basics touch points of fiber optics and their contribution to our everyday lives. Fiber optic technology utilizes highly flexible, transparent fiber comprised of extruded glass or plastic to transmit data. A fiber optic cable incorporates glass threads as thin as human hair, each of which is able to transmit messages modulated into light waves. Although these cables are made with glass, they are highly durable and have the ability to be quite malleable. Covering the glass cables is a special protective coating called cladding. Cladding is made from a material that can reflect light back into the core of the cable, creating a mirror-like wall. A final layer is used as a buffer coating to further protect the glass cable from damage. What Are The Uses Of Fiber Optic Technology? Benefits of Optic Fibers Vs. Traditional Metallic Wiring? Besides the fact that conventional metallic wiring is far more expensive to produce, fiber optics deliver a superior amount of quality, convenience, and durability currently unmatched in telecommunication technology. Although the majority of our practical applications in the past used metallic wiring, fiber optics technology is rapidly growing and seems likely to stay for generations to come. Digital signaling - Optical fibers are suited naturally to accommodate digital information, a dominant form of data that we use for computer networks. Optimized Capacity - Copper or metal wires are very thick, and are unable to be as portable or flexible as fiber optic wires due to the fiber’s hair-like thinness. This allows fiber optic wires to optimize carrying capacity, allowing more channels to be available in any given area. Signal Integrity – Losing signal is far less common with fiber optics. Especially considering the majority of transmitted data is digital. The core of the optic fiber cable is made of glass, rendering the signal immune against electrometric interference, crosstalk, impedance issues, and more. Affordable – The production of optical cables are less expensive than the production of copper wire. When considering the advantages and capabilities of fiber optics in comparison to metallic wiring, the affordability increases the value of usage over copper wire immensely. Light Signaling – Where metallic wiring utilizes analog, electrical signals, optic fibers utilize light. This means that one fiber does not interfere with another fiber within the same wire, allowing for a clearer signal during phone calls or while using the internet. Flexibility – The usage of fiber optic technology is highly adaptable to many industries. Telecommunications and computer networking specifically, which utilize fiber optics to maintain performance, are used frequently as essential parts of modern living. Optic fiber cables are also immune to environmental damage, protecting them against temperature fluctuations that could otherwise damage metallic wires. In addition, optic fiber wires can be submerged in water, allowing them to reach destinations otherwise impossible for copper cables. Increased Safety – Optic fiber cables do not use electricity, and therefore there is no chance of sparking or fire hazards. In today’s world, many businesses and individuals rely on a dependable and proficient connection to perform their daily tasks. 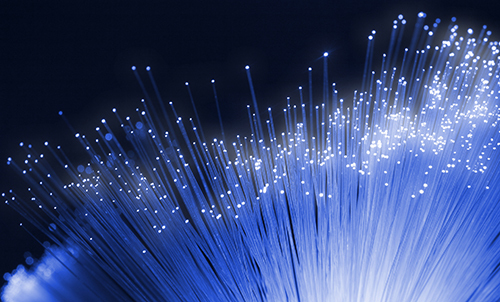 Fiber optic technology delivers service on a level of quality that commercial organizations and industries recognize. In fact, the majority of these industry leaders have moved onto fiber optic technology as it continues to make its way throughout all areas of telecommunication. The expansion of fiber optics within internet services, television, streaming media, network gaming, social media, and more, has made a profound impact in what both individuals and organizations have the ability to do. Fiber optic technology will continue to offer many more opportunities to provide users with affordable, more convenient, and higher quality data communication.